This seven-week whole-church resource explores what it means for a church to be a worshiping community. This Leader’s Kit contains everything you need to evaluate, plan, promote and run an engaging and immersive program with your church. At each and every moment of our lives, we are all living in a way that "gives worth" to something. For many people, their ideas of worth are centered on themselves, their family or their job. But for those who have discovered the grace of God in Jesus Christ a massive change has taken place. By the power of the Holy Spirit in our lives, we are enabled to start worshiping the one true God instead of the many false Gods we fill our lives with. Inside the Leader Kit box you will find a copy of the Leader's Guide, a copy of the Member's Handbook and a copy of the DVD containing seven teaching sessions presented by Jared Wilson (running time: 120 minutes). Please note, this DVD is available in NTSC format only (All modern DVD players play NTSC in the UK). What is true for us as individuals is true for us as a gathered community of God’s people. We discover in the Bible that a church that is centered on the gospel of Jesus Christ will be shaped by the gospel of Jesus Christ. And a church shaped by the gospel of Jesus Christ will see that its true service of worship is conducted both inside the formal gathering of believers and outside it as well. 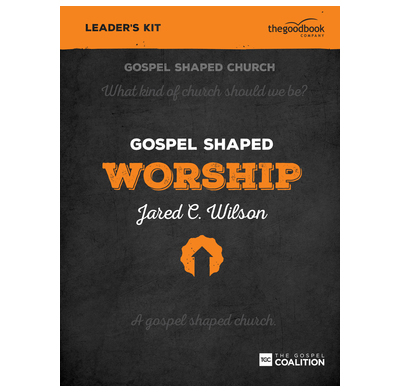 Additional copies of the Gospel Shaped Worship Handbook and the Leader's Guide are available.